Got a housewarming to attend? Looking to surprise that special someone with a little something different? We have you covered. 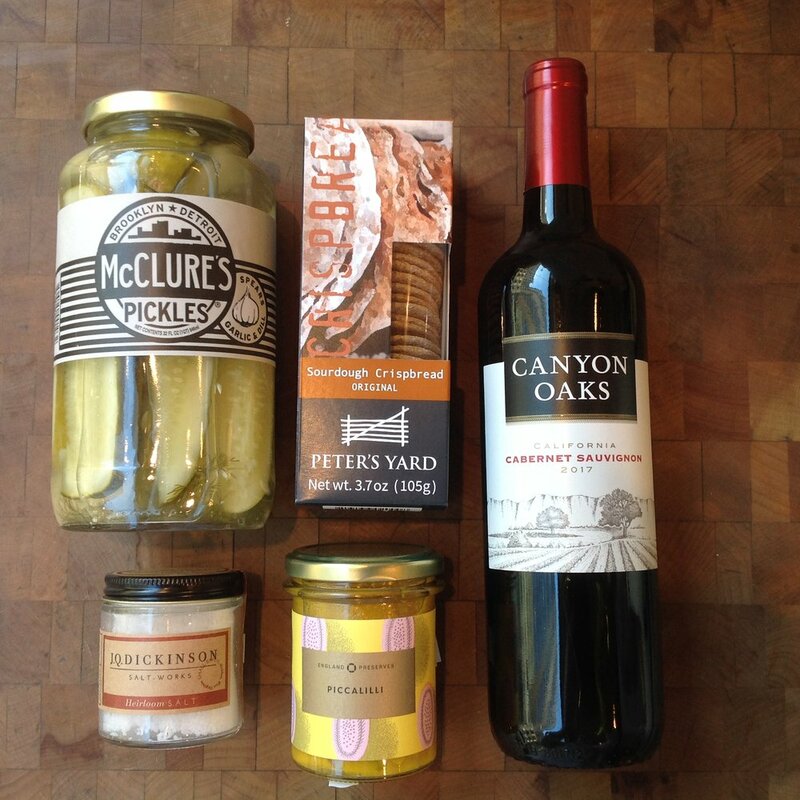 We offer a selection of gift baskets that we carefully curate to highlight some of our favorite products. **Please note that these baskets do not ship; in-state delivery and in-store pick up only! If you would like to ship a gift please check out our Gifts That Ship space. This basket contains everything you need to have a cheese plate, except the cheese! 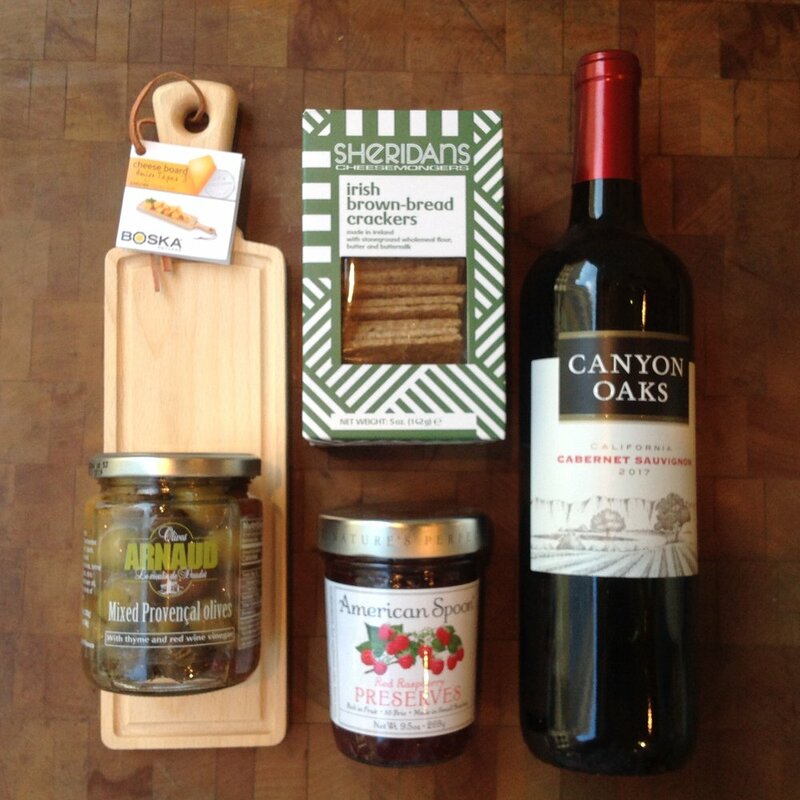 A bottle of wine, a jar of jam, a cheese board, crackers, olives, and candied nuts. This basket contains everything you need to have a cheese plate, except the cheese! 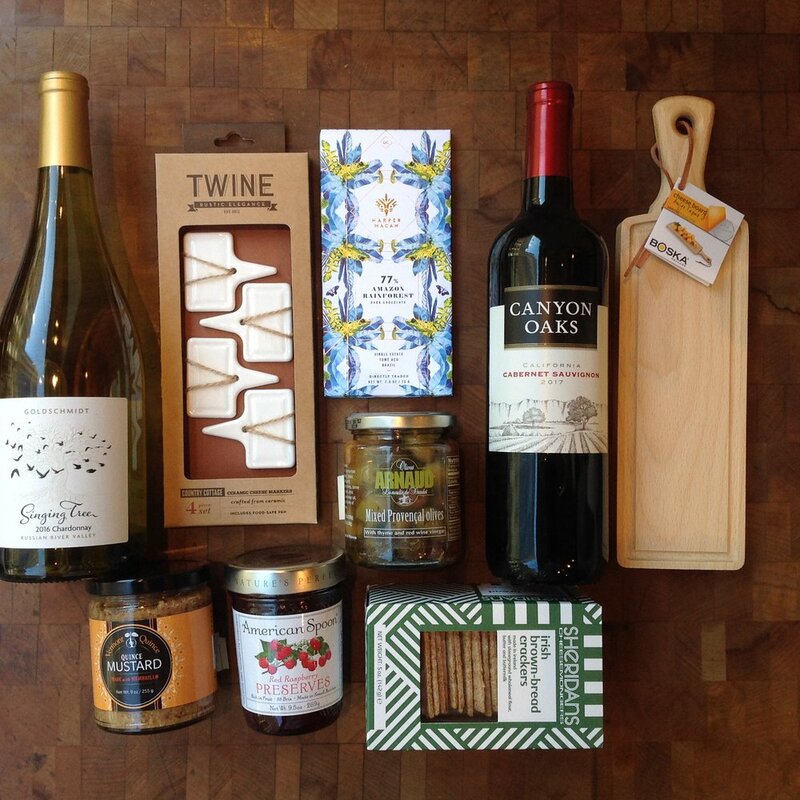 Two bottles of wine, a jar of jam, a cheese board, crackers, olives, candied nuts, cheese markers, mustard, and chocolate! This basket contains everything you need to have a cheese plate, except the cheese! Three bottles of wine, a jar of jam, a cheese board, crackers, olives, candied nuts, cheese markers, mustard, pickles, honey, and chocolate for dessert! This basket is chock full of savory, so plan your next meal or get together with your favorite food lovers. 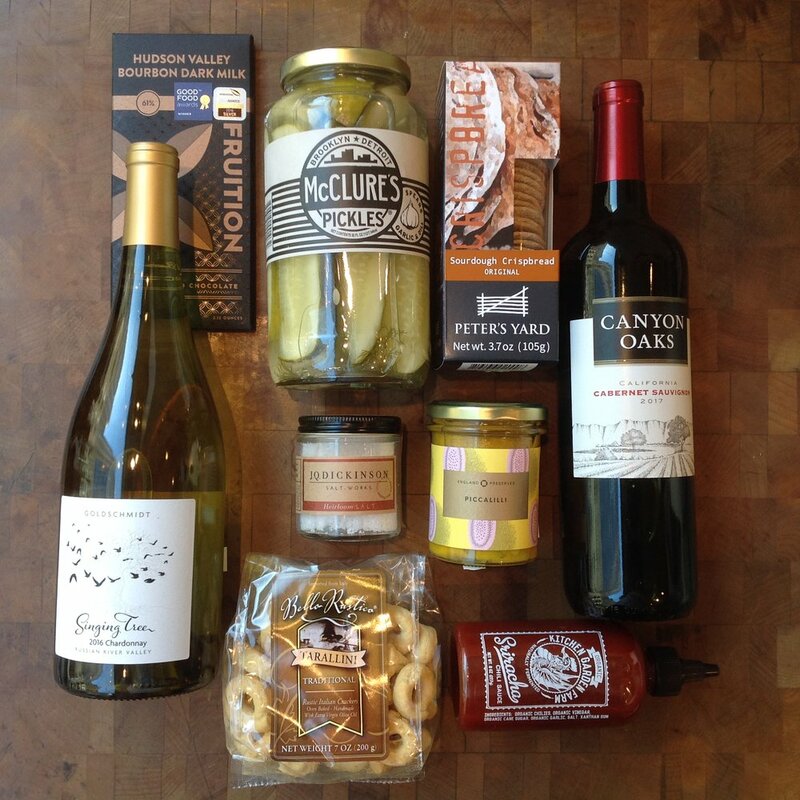 A bottle of wine, heirloom sea salt, a peck of pickles, a jar of Piccalilli, and sourdough crackers. This basket is chock full of savory, so plan your next meal or get together with your favorite food lovers. Two bottles of wine, heirloom sea salt, a peck of pickles, a jar of Piccalilli, sourdough crackers, sriracha, taralli, and dark chocolate. This basket is chock full of savory, so plan your next meal or get together with your favorite food lovers. Three bottles of wine, heirloom sea salt, a peck of pickles, a jar of Piccalilli, sourdough crackers, sriracha, taralli, dark chocolate, balsamic vinegar, extra virgin olive oil, black tea, and cranberry crisps. This sweet box makes the perfect Yankee Swap gift, or a sweet hostess gift. It has palmiers, candied pecans, gummy candy, strawberry shortbread, and chocolate. This box has everything you need for a night in with a bowl of pasta. A bottle of wine, pasta, marinara sauce, bread sticks, and extra virgin olive oil. This box is perfect for offices or parties, there’s a little bit of sweet for everyone. It has palmiers, pretzils, chocolate shortbread, sipping chocolate, m&m’s, and two chocolate bars.